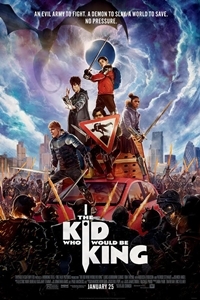 Dean ChaumooRelease Date: January 25th, 2019Old school magic meets the modern world in the epic adventure THE KID WHO WOULD BE KING. Alex (Ashbourne Serkis) thinks he's just another nobody, until he stumbles upon the mythical Sword in the Stone, Excalibur. Now, he must unite his friends and enemies into a band of knights and, together with the legendary wizard Merlin (Stewart), take on the wicked enchantress Morgana (Ferguson). With the future at stake, Alex must become the great leader he never dreamed he could be.